In 1985 Motorola was looking to create a DSP (Digital Signal Processor) line of processors to go with their very popular 68000 series of general purpose processors. DSP’s are similar to a normal processor but, as their name implies, are designed to work on signals, versus data stored in memory. Typical signal data is audio, video, RF (such as RADAR information) and anything else that comes in via an ADC. These signals are processed via algorithm such as FFTs (Fast Fourier Transforms) to manipulate, change or analyse them. In audio, this can be used for cleaning up an audio stream, adding effects to it, or even generating audio. In the 1980’s the main single chip DSP competitors was the still in use TI TMS320 series. the ATT/WE DSP16 series, and some DSP’s from OKI/NEC. When Motorola began work on what would become the DSP56000 they asked one of their long time customers, Peavey, what they would like to see in a DSP. Peavey is an audio equipment manufacturer, making such things as guitar amps and keyboards, so would have a good idea of what would be useful in a DSP designed for audio signals. These were packaged in a ‘SLAM’ package. The contacts/traces were easily damaged by leaking batteries. 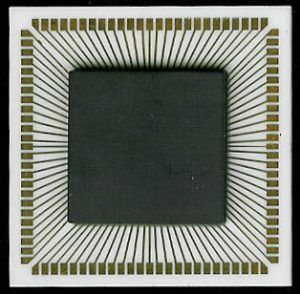 The DSP5600 is a 24-bit processor made on a 1.5u HCMOS process with around 150,000 transistors. 24-bits were selected as that was ideal for audio sampling at the time (and most ADS/DACs at the time max’d out at 20-bits of resolution anyways. These DSP’s had a 3-stage pipeline and ran at 20.5MHz, 27MHz and 33MHz. This provided around 10.25 MIPS of performance (at 20.5MHz). They were a fixed point (no floating point support in hardware) design, which was adequate at the time. A total of 62-instructions were provided. RAM instead of 3.75K of program ROM and a 32×24-bit bootstrap ROM for loading the program RAM. This is the version that became most popular. Peavey used the 560001 (3 of them actually) to power the DPM3 SE keyboard back in 1990. Recently J. Acorn, from Crasno Electronics in Canada sent The CPU Shack Museum an e-mail inquiring if I had a few of these now obsolete 56001 DSPs spare, to rebuild some dead Peavey keyboards. As a Museum, I not only like to collect and present vintage IC’s but also regularly help people with project such as this, and have thousands of CPU’s sitting around that have been acquired through the years (really its a bit crazy how much I have collected lol). Mr. Acorn needed 2 of these DSPs to replace ones destroyed by a leaking battery in a keyboard, and two is exactly what I had spare. I dug them out, packaged them, and off to Canada they went. The result? A restored and working Peavey keyboard. You can read about the restoration process on Crasno’s site. 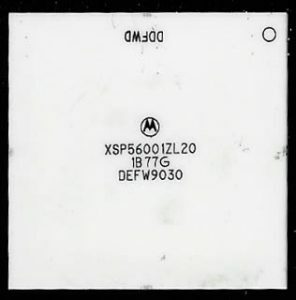 The 56000 series continued to be made by Motorola (and then Freescale) up until 2012 when it was announced it would be discontinued as a standalone product. 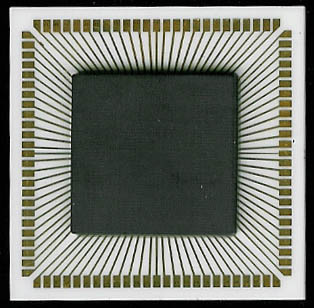 The 56000 series cores though live on, inside of other Freescale (now NXP) products.